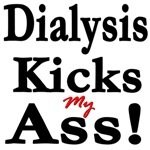 This entry was posted in Access, Catheter, dialysis, dialysis equipment, Home dialysis, kidney and tagged blogging, dialysis, ESRD, hemodialysis, kidney, patient. Bookmark the permalink. You bot have good, valid points about each. I personally prefer in-center because of the sterile conditions, someone else sticks (I’m chicken!) and I like the social atmosphere with friends and acquaintances. Thank you for the kind words. I am just writing from my heart and soul and it has really helped me writing the blog to get things out which has been a problem for me in years past. In 2003 i was stuck by a needle at work and developed HIV unfortunately. For years i dealt with depression and held a lot of stuff in because i was brought up in the 60’s and 70’s where men just sucked it up and it was considered to be weak to express your feelings. When i was in the hospital for all of this past May i made a decision after finding out i was ESRD to change my way of thinking about how i would handle this disease. I wanted to be a better husband and father for my wife and two daughters. Also a better friend for all my lifelong friends. So i thought a few months ago to start the blog and away i went. Excellent! Glad you made that decision! I just wanted to make a comment with regards to Mr. Stewarts comment about the pitfalls of home hemo. I hope i do not come across as totally negative about home hemo because the positives far out weigh the negatives for me anyway. For starters your body prefers long and slower blood flow dialysis and it is much more effective at removing toxins and extra water. Especially for bigger men like myself (6 foot 4 265 pounds) and since my kidneys are in very bad shape i want to do everything possible to help them as much as i can until i have a transplant. I talked to a few other guys at the home hemo unit and they told me it is like night and day in how you feel going from 3 four hour runs a week at the renal unit to 5 eight hour runs a week. Plus i feel very empowered being in control of my own health which is a good feeling. Now there are negatives as well but ESRD is a very complex and time consuming disease so there is no perfect solution for any individual. Every person is different and that is perfectly alright in my opinion. I often tell people that dealing with the HIV virus the last ten years has been very difficult but it is a piece of cake compared with ESRD mostly because of how it effects your way of life. Thanks for that point of view! There are very few patients that can offer it.